He loves picture, she loves manga: we love Las Vegas and WPPI! Photographs that become drawings, due to different forms of art that are spoken in a spectacular album: this is the result of the work done as a wedding photographer for Cindy and Jimmy! At the base of everything, of course, there are them: the spouses. Cindy and Jimmy chose the splendid Villa Il Pozzo, in Certaldo, to celebrate their wedding: an ancient dwelling furnished in Mediterranean style and dipped in the hills that link Siena with Florence, in the heart of Tuscany where the gaze get lost in the unmistakable towers of San Gimignano. A ceremony that Ilaria from Glam Events has taken care of in every single detail: they have join in marriage on the wonderful natural terrace that overlooks the countryside, surrounded by dearest affections that have embraced them with smiles and emotions. We have immortalized everything: from the most intimate moments of preparation of the bride, in which Cindy was cuddled by her bridesmaids, to the wild dances that ended the party. 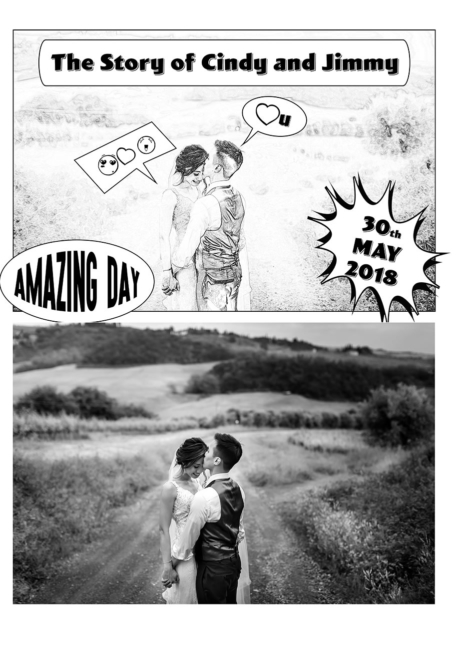 This wedding in Certaldo has been a day in crescendo which then became an album where the photographs are intertwined with comics. The idea was born from my passion for this form of art - comics - and from the desire to create a project where graphics and photography meet and intersect. The aim was to tell the story in a different way: to elaborate the image in "taking off" - removing information, colors, shadows - and instead seeing what the design lets us imagine. It has become an interesting circuit, made of a continuous exchange between graphics and photography. This combination has allowed us to create a timeless album, because comic gives timelessness to the image: it releases it, in a certain sense, from the contemporaneity that photography fixes and brings it, instead, to a less defined and more long-lived level. Moreover, research is important even in the work of the wedding photographer, it is the continuous will to push towards experimentation and the crossing of different languages. This album, titled "He loves picture, she loves manga" was excellently produced by our Floricolor friends. He earned third place in the "album division wedding multiple photograpers" category at WPPI (Wedding and Portrait Photographers International) in Las Vegas, 2019 edition! It is the fifth consecutive year that we return from Las Vegas with a prize: we are really happy! https://www.davidbastianoni.com/wp-content/uploads/2019/04/wppi-2019-album-division-wedding-multiple-photograpers-bastianoni-00000.jpg 1291 975 Admin https://www.davidbastianoni.com/wp-content/uploads/2018/08/logo-bastianoni-140.png Admin2018-09-09 12:12:022019-04-12 18:06:01He loves picture, she loves manga: we love Las Vegas and WPPI!